Add 2 Year Extended Warranty - $138.00 ? 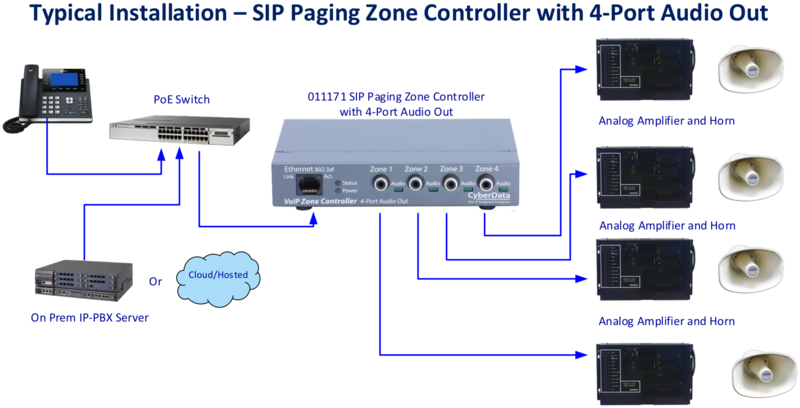 The CyberData SIP Paging Zone Controller with 4-Port Audio Out enables access to existing paging speakers through a VoIP phone system. The interface is designed to use a standard paging amplifier with 10K ohm audio inputs and supports paging to up to 15 zone groups from a VoIP phone. CyberData has maintained one of the most comprehensive lists of IP PBX servers certified to work with CyberData VoIP Products. What amplifiers has the Zone Controller been tested with for interoperability? The Zone Controller has been tested with the TOA 900 series power amplifier for interoperability. Can you give me specifications for the correct alternate power supply needed if I don?t have a Switch? The most cost-effective option would be to use our Power Injector (010867), plugging one end into the network source (non-PoE hub) and one end into the device. Alternatively, for products like the Paging Server (011146), the Paging Gateway (010846) and 4 Port Zone Controller (011171) with the +48v power jack, we recommend using the CISCO 48V supply CP-PWR-CUBE-3. These devices can be powered locally with a power adapter (Cisco part number CP-PWR-CUBE-3=) and the appropriate power cord (power requirements for the power adapter: 100-240 VAC, 50-60 Hz, 0.5 A).